You are a descendant of the stars you see in up in the night sky. You are not only separated from them by immensities of space; you are separated by immensities of time. You are made of star stardust. We are made mostly of carbon, nitrogen and oxygen, as well as really important heavier atoms that play keys roles in our biology; Iron, Phosphorus, and so on. Where did all these atoms come from? About 4.5 billions of years ago when the universe was forming atoms combinations, were vital in the formation of planets- and even better, the formation of life. These atoms formed during the “Big Bang”. The “Big Bang” is a theory that deduces the cataclysmic (the big bang!) birth of the universe. This “Big Bang” started with the elements such as H and He. 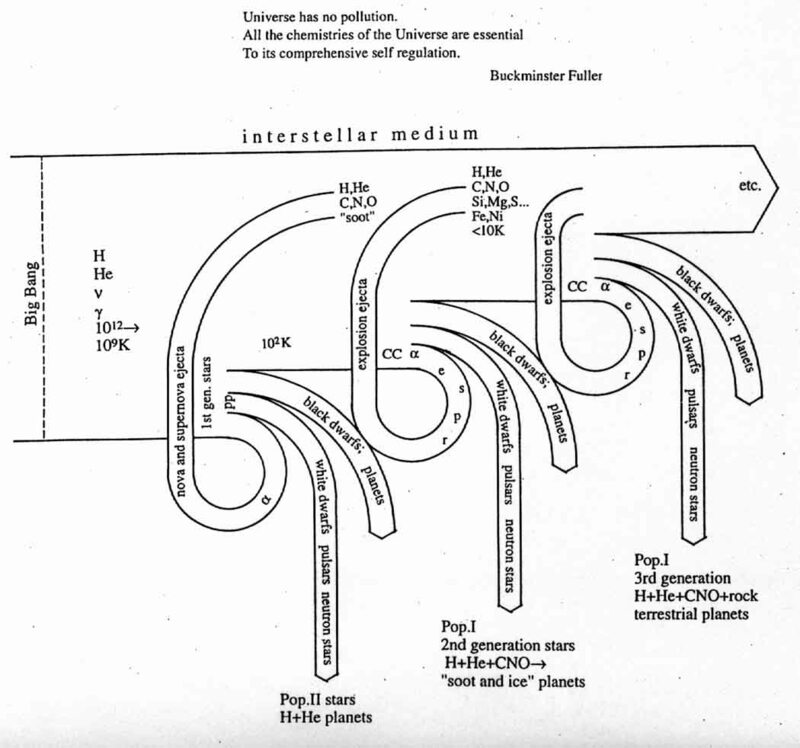 These elements helped make the first stars (first stage in figure). Now, I bet you are wondering how the first stars have anything to do with you. Stars generate energy by doing nuclear fusion. Nuclear fusion is the combining of atoms to make heavier atoms. So, these first stars helped make new atoms never before seen in the universe! We are made of stardust because nothing is ever wasted in the universe, it just “recycles” (see figure). In this figure, time moves from left to right. It starts from the Big Bang and ends at the stars that are living now, including the sun. The Big Bang created H and He. These elements then go into the first generation stars. The stars during their lifetime make other elements through nuclear fusion. When the first generation star dies, it lets out medium sized elements C, N, and O as well as H and He. After these are let our into the interstellar medium, or space, it creates the second generation stars. The second generation stars then create new elements, again, during nuclear fusion. When these stars die, they let out heavier sized elements including Fe as well as all the elements let out before. As everything else in the universe, stars grow old and die. A star’s life is very important to our connection. It consists of a star exhausting its hydrogen and then dying. Before a star dies, however, it creates new elements through nuclear fusion. When a star dies it has a massive explosion called a supernova. After the supernova has occurred, the elements already existing and made during the star’s life disperses throughout space. Due to this process a star goes through, you can see a cycle between stars. The new stars take in what the old stars made and make NEWER elements out of that. For example, the first stars, which start out with H and He, make the middle weight elements C, N, and O and release them when they die. Newborn stars take these middle weight elements and use them to make heavier elements such as Fe, Ph, and Si. Without the old stars, new elements would never have been made and neither would we. We are made of generations of stars. So how does all of this explain that we are made of stardust? Without the dispersion of elements, life would never have been created. We needed the first and second generations of stars to create the medium and then heavy elements that were dispersed, so the third generation of stars, which includes our Sun, could create life. All in all, we are two generations of stars. 1. How many star generations are shown in the graph? 2. Which best describes a star’s life? 3. Which generation of stars first introduces Carbon (C) to space? Could there be other living things living in space that we do not know about? How do we find out if there are other living things in space? Many people have been wondering about these things for years and there are still people wondering about other living things. Radio signals have been around for years, and we use radio signals for all of our technology. Radio signals allow us to watch television, talk on our cell phones, and to do many other things we use daily. They have been around since World War II broadcast all the way to Justin Timberlake, which we use radio signals to listen to the radio stations. There are millions of people watching television every day that means millions of broadcasts are getting sent out to space. 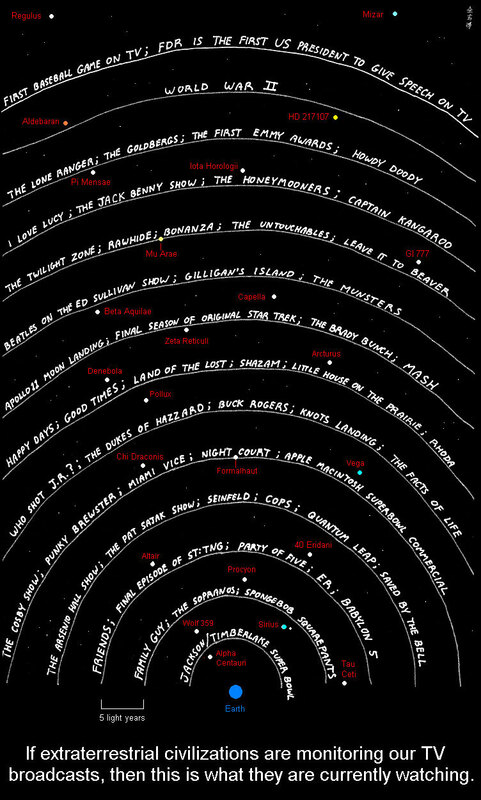 The graph below shows how far these radio signals have traveled, it is labeled from when the first baseball game appeared on television (which has moved far away from Earth) until Justin Timberlake became popular (which is still close to Earth). Each circle represents 5 light years away from Earth, for example, ‘Happy Days’, ‘Good Times’, ‘Land Of The Lost’, and ‘Swazam’ are now 35 light years away from earth. This brings me to my topic about SETI, which stands for Search for ExtraTerrestrial Intelligence. If other planets gave off radio signals as our Earth does, then we might be able to detect them. SETI was developed to detect alien radio signals and they also try to search for intelligent life, but it can sometimes be difficult because it is hard to reach other planets that are maybe Earth-like. SETI is an exploratory science that looks for evidence of life in the universe by looking for some signature of its technology. SETI believes that life on Earth suggests that given a suitable environment and sufficient time, life will soon develop on other planets. SETI uses radio telescopes to look for alien life because radio waves penetrate our atmosphere. In the graph below, it shows the wavelengths of light, that the Earth lets through the atmosphere. The y-axis is the atmospheric opacity, opacity is how much something gets absorbed. If the opacity is 100% that means that atoms in the atmosphere absorbs all of that type of the light, meaning NOTHING gets through to Earth. The x-axis is the wavelength, which tells what type of light it is. Visible light has a wavelength of a millionth of a meter (called a micrometer or = um), whereas radio has a wavelength from centimeters to meters. It is clear from the graph that opacity near the radio range is near 0%, which means radio waves from space are easily detected from Earth. SETI focuses on a wide set of disciplines, from observing, to modeling the precursors of life in the depths of outer space, to studies of Earth. Scientists working for SETI even make their own radio patterns that they broadcast into space, the radio signals are supposed to express things like the intelligence of our civilizations. If aliens were ever to find these special SETI messages they will know that the Earth is a safe place to visit. SETI has tested many experiments to figure out what the alien civilization could possibly use for interstellar communications at optical wavelengths. The interesting thing about SETI is that the signals are designed to be more like a laser and less like a flashlight, the normal signals that we broadcast from television and radio “spreads out” much more like a flashlight. When you are stretching something over a bunch of thin space it becomes weaker. If you held a flashlight in your hand and tried to find something under your bed you probably would be able to find it if you were closer up on the object,rather than being further away. The farther you are away the weaker the light from the flashlight becomes. If we want to send messages to aliens that are far away we don’t want the signals to get weaker with the distance. Will we ever be able to detect aliens? Are we alone? Will there be a UFO crashing into our planet sooner than we think? Hopefully, in the near future SETI will be able to detect aliens. 1. How does SETI send messages without weakening the signals? 2. Do you think SETI is doing a good job at detecting alien radio signals? 3. According to the graph, do you think X ray telescopes are space telescopes or ground telescopes, why? 4. According to the first graph, how far away in light years was the first television broadcast of ‘The Twlight Zone’?